2012 – Will India Sizzle or Fizzle for International Fashion Brands? Among consumer sectors, very few can match up to fashion in terms of its global nature. Despite food having led the way in global trade through spices, it is the fashion sector that led the global march of brands. As the economies in Europe and Asia recovered and grew, historical colonial linkages as well as modern culture-vehicles such as movies carried images of what was cool in the benchmark culture. Fashion brands were the most identifiable representation of cool. India itself has known international fashion and luxury brands for several decades. From the mass footwear brand Bata to the top-notch luxury of LVMH, some of whose most important global customers included the rulers of Indian princely states, international fashion brands have an age-old connection with India. 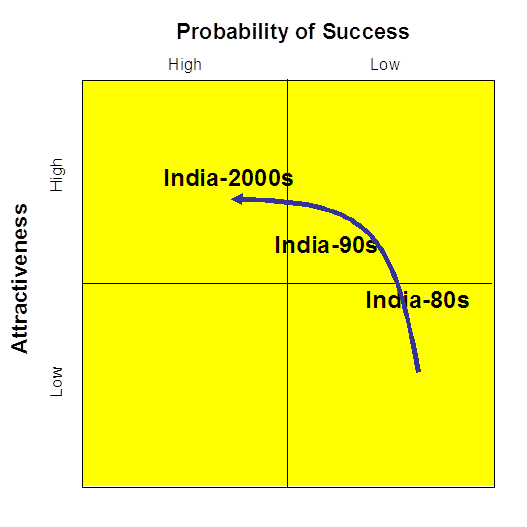 In spite of these old links, the absolute base of consumers for fashion brands was small, and for them, prior to the 1980s , India was a relatively low potential market with low attractiveness and low probability of success. A transition began in the 1980s, as India moved emphasis from central planning and a restrictive economy to a more liberal business regime, and brands and modern retailers started growing in presence gradually. During this transition period, other than the notable exception of Bata, it was mainly Indian brands that were at the forefront of modernisation of retail in India, with the first retail chains being set up for textiles, footwear and clothing. Though the seeds were laid earlier – Liberty is credited with the launch of the first ready-to-wear shirt brand in the 1950s, Raymond with the first ready-to-wear trouser brand in the 1960s – the growth started in real earnest only in the 1980s when apparel exporters such as Intercraft (with brands like “FU’s”), Gokaldas Exports (“Wearhouse”), and Gokaldas Images (“Weekender”) also tried their hand at modern retail, as did corporate groups (“Little Kingdom” for kids and “Ms” stores for womenswear). Yet, even in the early to mid-1990s, when western companies looked at the Asian economies for international growth, West Asia and East Asia (countries such as Japan, South Korea, Taiwan and even Thailand) were seen as more attractive due to higher incomes and better infrastructure. In the mid-1990s there was a brief upward bump in international fashion brands entering the Indian market, but by and large it was a slow, steady process of increase. By the mid-2000s, however, a very distinct shift became visible. By this time India had demonstrated itself to be an economy that showed a very large, long-term potential and, at least for some brands, the short to mid-term prospects had also begun looking good. In a few years, from 2005 onwards, the number of international fashion brands entering the market has increased 4-fold. The sheer number of brands that are now present in India and the new ones that are entering every year is a clear sign of strengthening confidence among international brands that India is now one of the most important markets that they cannot ignore for long. 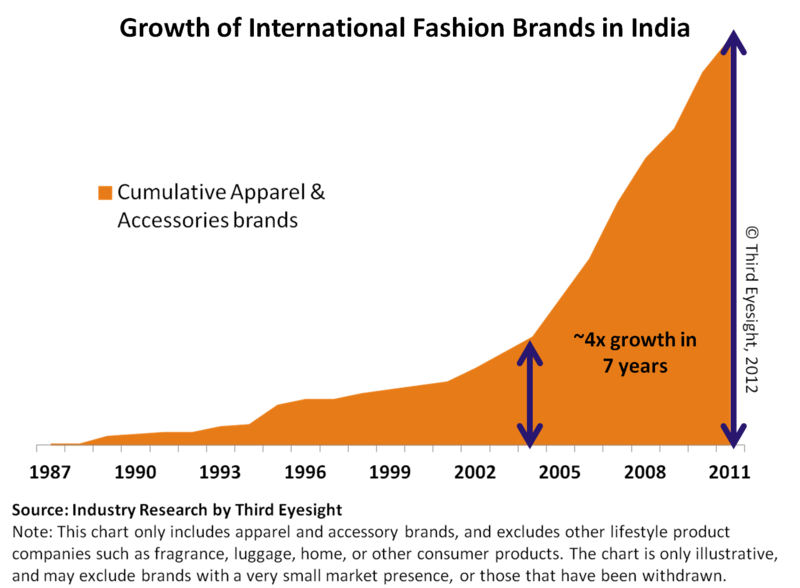 There is a visible acceleration of growth in absolute revenues, too, being achieved by individual brands. Brands such as Levi Strauss, Reebok, Louis Philippe (a British brand formerly owned by Coats Viyella, now by Aditya Birla Group for India and other territories) and its sister brands took perhaps 12-15 years to break through the threshold of Rs. 500 crores (Rs. 5 billion) in sales turnover, but industry opinion is that the “0 to 500” trajectories today are faster and that younger brands are likely to take less time – under a decade – to cross the threshold. While modern apparel retail currently contributes less than 20 per cent of the total apparel market, with growing incomes and increased availability of modern retail environments, consumers are spending more on branded fashion than ever before. In the year closing March 2012, at least 2-3 additional brands (including Indian ones) are expected to cross the Rs. 500 crores threshold. Clearly, there are few markets globally that can support potential growth from zero to US$100 million in a decade, with the potential to even reach a billion-dollar mark within the next couple of decades. However, some of these markets are already hugely competitive, and also going through painful economic churns. India, on the other hand, is a market that is at the earliest stages of consumer growth – it is, in the words of the managing director of a European brand, a market where “a brand can enter now and live out its whole lifecycle”. In fact, it is tempting to compare the emerging golden bird of India to the golden dragon of China where western brands seem to have rapidly established as products of choice for the newly affluent Chinese consumer during the last 15 years or so. In our work with brands and marketers from around the world, we have to constantly remind them that not all emerging markets are the same. The explosion of luxury and premium brands in China during the last decade or so has happened on the back of explosive economic growth that came after a long cultural and economic vacuum. When the new money wanted links with the old and when uniform grey-blue suits needed to give way to something more expressive, well-established western premium and luxury brands provided the most convenient bridge. On the other hand, in India “discernment” may be a new experience to the newly-rich Indians for whom brands can be a valuable guide and “secure” purchase, but discernment and taste are not new to India as a whole. More importantly, differentiation and self-expression never disappeared even during India’s darkest years of “socialistic” economics. Therefore, the Indian market has a more “layered” approach to the premium fashion market and will continue to grow in a more fragmented, more organic manner than the Chinese market. There would be multiple tiers of growth available for international as well as Indian brands. For international brands customisation and Indianisation will be important. This is already visible in bespoke products by Louis Vuitton and Indian products by brands such as Canali (jackets) on the one hand, and significant re-thinking on product mix and pricing by brands such as Marks & Spencer. That brands are willing to rethink their position in the context of the Indian market demonstrates that they see India as a strategic market, worth investing in for the long term. Another sign of the growing confidence amongst international brands in the Indian market is the number of companies that are looking at directly investing in joint ventures, or even going further to set up wholly-owned subsidiaries in the country. It is worth keeping in mind that setting up a subsidiary is a decision that is not taken lightly, regardless of the size of the business and the amount of investment, since it involves a disproportionate amount of management time and effort from the headquarters during the launch and early growth phase where revenues are small and profits non-existent. Among our clients, brands have taken the decision to step into an ownership structure in India when they feel that India is too strategic a market to be “delegated” entirely to a partner (whether licensee or franchisee), or that an Indian partner alone may not be able to do justice to the brand in terms of management effort and financial capital. In the last few years we have seen several brands take the plunge into investing in the Indian business, among them S. Oliver (Germany), Marks & Spencer (UK) and Mothercare (UK). During 2011 specifically, Promod changed its franchise arrangement with Major Brands into a joint-venture that is majority-owned by Promod. From its launch in 2005, the brand has opened 9 stores so far. However with the new JV in place, the venture is reported to be looking at opening 40 stores in the next five years. Most recently, Canali was one of the brands that moved into a majority-owned joint-venture. The brand entered in India in 2004 through a distribution agreement with Genesis Luxury. This has recently given way to a joint venture between the two companies that is owned 51 per cent by Canali. The brand currently operates five exclusive stores in India has plans to accelerate the brands growth in India by opening 10-15 stores over the next three-four years. If a “theme of the year” has to be picked for the Indian retail sector in 2011, it must be ‘Foreign Direct Investment’. The debate during the year was hardly a clean and clear “pro vs. con” exchange of ideas. It was a motley mix of extreme lobbying for and against FDI, some balanced reasoning on why FDI should be allowed, and also moderate voices calling for governing the speed at which and the conditions under which foreign investment could be allowed. In many cases there seemed to be dissenting voices emerging from within the government. One possible impact of this uncertainty through the year was that several brands postponed their decisions regarding the potential entry and the strategy that they would follow in India with regard to partnership or investment. In November 2011, the Indian government announced that 100 per cent foreign investment in single brand retail and 51 per cent foreign ownership of multi-brand retail operations, but was forced to back-track due to vociferous opposition from several quarters. At the very end of the year, the government finally reopened 100 per cent foreign ownership retail operations, albeit limiting it to single brand retail businesses. However, it allowed this under the condition that the Indian retail operation would source at least 30 per cent of its needs from Indian small and mid-sized suppliers. The condition of 30 per cent domestic sourcing from SMEs is well-intentioned – aiming to provide a growth platform for India’s manufacturing enterprises – but unachievable for brands that do not currently source any serious volumes from India. In fact, for most international fashion brands India contributes less than 10 per cent of their total sourcing, in many cases well under 5 per cent. Under these circumstances, we shouldn’t expect any dramatic changes, though we do expect the growth in joint-ventures and subsidiaries to continue in the coming months and years. If an international brand perceives India to be at the right stage of development, and it wishes to exert significant or complete control over its Indian presence, then a majority or completely owned subsidiary seems the most logical step, and the brand will find a way to structure its involvement in India appropriately. However, many brands that today have a 51 per cent ownership in India are stopping short of climbing to 100 per cent until they can sort out how to meet the SME sourcing conditions. The problem with the 30 per cent sourcing rider is simple. When a brand launches in India, it would like to present the consumer with the most complete product offering that showcases its capabilities and positioning as relevant to the target consumer in India. In most instances, the brand would not be sourcing the full range of its merchandise from India. This is not a problem if the brand approaches the market through a wholesale or franchise structure, or even with a retail business that is not owned by it 100 per cent. But for a retailer that wants to own the Indian business completely, complying with the 30 per cent domestic sourcing restriction means developing a new set of suppliers in India from scratch, pulling in the design and product development staff to work with them, and to develop ranges that suit not only the Indian market, but also other markets around the world. Simply putting together an India-specific sourcing team to replicate the entire range to buy small volumes for the Indian business is neither practical nor feasible for most of these brands. This means that the product development and sourcing team must be willing to see India as a strategic supply base for the future, just as their selling-side colleagues may be seeing it as a strategic market. In this context it is worth repeating something that I have said before: retail managers are generally risk averse, and like to move in packs – where there are some brands, more come in and create a mutually reinforcing business environment. The presence of other international brands – especially from their own country – helps in creating a familiar context at first sight and encourages further exploration of the market. At least for the executives handling international retail expansion, India presents a more ‘familiar’ and ‘developed’ face today than ten years ago. However, the explosive growth that we have witnessed in terms of the number of brands present in India is not mirrored by the growth of fashion sourcing out of India. In fact, even when compared to what has happened in the global textile, apparel and footwear sourcing environment since quotas were removed in 2005, the India’s export growth looks dispiritingly low, even stagnant. China still remains the largest source for fashion products, while countries such as Bangladesh, Indonesia and Viet Nam have grown their share aggressively. India’s share of clothing exports is a lowly one-tenth that of China. In our work related to global sourcing strategies for western retailers, on an objective measurement matrix of sourcing competitiveness India rates highly. In several cases, sourcing from India as a hub (and, for European retailers, Turkey as a hub) has been seen as a logical counterweight to balance out the high concentration of current sourcing in China. However, product development and sourcing is not entirely an objective process – in fact, sourcing habits are sometimes the hardest to change. The buyer’s subjective experiences – sometimes buried deeply in the past career – have a significant role to play. A conversation from 2001 with the sourcing head of a European brand sticks in my mind, when he said, “I don’t really want to buy anything from India – Indian suppliers can do a very limited product range, quality isn’t always good and the shipments are always late.” On probing further, I discovered that his last transaction was in 1992, after which he never set foot in India again. Much as we might present statistics and facts about the developments in the Indian textile and apparel industry, a personal injury early in his career has left a deep scar that obviously influenced this gentleman’s buying decisions worth over €300 million in global apparel sourcing, or about €700-800 million worth of sales. There is clearly much to be done in terms of encouraging modernisation and better organisation amongst apparel suppliers, and making those changes visible to buyers. Even brands that are well-engaged with the Indian supply base have between 40-70% of their people here focussed on in-line and post-production quality issues. We are today at a stage where larger and better-equipped apparel exporters would be best placed to address the needs of international brands within India, but find the volumes too small to bother with setting up entirely different documentation and accounting processes. Health & Safety and Labour compliances are also areas in which the brands will not forego their corporate standards. Can we imagine a brand saying that its European customers do not want their products made in sweatshops, but for the Indian consumers of the brand this is not (yet) an issue? While this may be a fact, would a high profile brand risk its global reputation to source competitively for its small Indian business? So a government dictat to international brands’ fully-owned subsidiaries to ensure that they source 30 per cent of their needs is not enough. At best it will encourage some of the brands to start looking at India more seriously, but a more likely scenario for most brands is that they will carry on business as usual until the supply base in India pulls up its socks, or until the business in India becomes large enough to be interesting to their existing Indian suppliers who are currently focussed on exports. Certainly the government itself needs to do much for more manufacturing-friendly policies, as well as focussed investment in infrastructure that can provide rapid, efficient and cost-effective transportation from the country and within the country. It is time to bridge the gap between “textile exports” and “fashion retail” in the country. Remember, the explosive growth of brands in China followed the manufacturing explosion, not the other way round. Until the Indian apparel, textile and footwear manufacturing sector grows strongly, the actual volume growth of modern fashion retail will remain hobbled, regardless of the number of brands that enter the market. In closing I would like to mention the least acknowledged, but a very important part of the growth of international brands in India: the acquisition of brands overseas by Indian companies. The Aditya Birla group laid an early foundation when it bought out, for India and several other territories, the perpetual rights for Coats Viyella’s brands including Louis Philippe, Van Heusen and Allen Solly. Lerros was a slightly different example – being a brand that was set up by the House of Pearl in Germany – but that also circled back to India. More recently (2010) we have the example of the Swiss company Switcher Holdings, whose with brands including Switcher, Respect and Whale, was bought by PGC Industries. In markets such as the EU, there are today brands that may be available because they are finding difficult to survive in harsh trading environments and that do not have the financial or management bandwidth to take on initiatives in growing markets like India. These offer a legitimate growth platform for Indian companies that are strong in manufacturing those product categories and want to move higher up the value chain from being a generic commodity “supplier”. 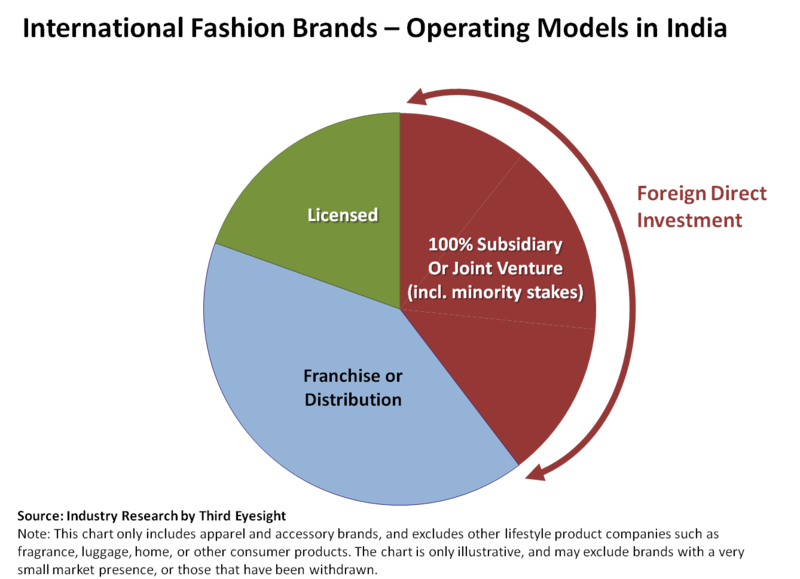 Although exporters may initially approach these brands for franchise or license relationships, to some it soon becomes clear that if they are in a position to make an incremental investment they could well own the perpetual rights and perhaps the whole business, rather than investing in building up someone else’s brand, especially in the business in India is likely to grow very rapidly. Obviously, this new-found confidence needs to be backed with solid management capability, but as other consumer goods companies such as Tata (beverages, automotive), Mahindra (automotive) and Dabur (personal care) have shown, it is entirely feasible to look at growth in India as well as internationally by using an existing international brand as a stepping stone. It also presents a challenge of classifying such brands as international or Indian. Bata was founded in the Czech Republic and went global from there – however, today it is legitimate to treat it as a Canadian brand since its headquarters moved there in the 1960s. Among other products, Gloria Jean’s Coffee was founded in the USA, but is now completely Australian-owned. In that sense, today would that not make Louis Philippe, Allen Solly, Switcher Indian brands? I think this puzzle is a challenge that many people in the industry in India would look forward to contributing to. Policies restricting foreign investment are not the biggest barrier to entering the Indian market. Brands and retailers that are clear that India is a strategic market with which they wish to engage will find a way. Even the largest global retailers have created structures that allow them a toehold in the market, awaiting a larger opening, despite the current ban on FDI in multi-brand retail. The biggest barrier to entering India is actually the comfort zone within which the management team of an international retailer or brand may be operating. For some, the business environment of India needs at least a small step outside that comfort zone, for others it needs a big leap of faith. There are encouraging signs of this happening already. Research carried out by Third Eyesight shows that the number of foreign brands operating in India in the fashion segment alone have quadrupled since 2005-2006, and a significant chunk of these are operating with direct investment in the Indian operations, whether as 100 per cent owned subsidiaries or as joint-ventures, indicating their growing comfort and confidence in the market. One last word of advice: assess the opportunity pragmatically; don’t come looking for “a small percentage of the 1.3 billion population” in the short term – it takes time and patience to develop a meaningful share in the market. An article in the San Francisco Chronicle sparked off a debate on whether ecologically friendly can be mainstream, whether customers will switch from traditional to eco-friendly fashions and if so, when. There is the view that eco-friendly products are necessarily niche and cannot match up in fashionability and affordability to ‘mainstream’ products. I don’t think it is an either/or choice between styling and eco-friendly. To sell, eco-friendly merchandise absolutely MUST be comparable to or better than eco-unfriendly merchandise, both in style and quality. While most consumers will not willingly pay higher prices for eco-friendly merchandise, that may change as the cost of being eco-unfriendly goes up through awareness and legislation. There was a time when safety belts in cars were optional at an extra cost. No one would argue against paying the extra price for safety today. Perhaps many of us would rather trash the planet cheaply because we may not feel the heat within our lifetimes. That is no reason that others, who feel more responsible, will allow that to happen indefinitely. One way or the other, eco-friendly merchandise will compare in price, too. Some of the parity will come from reducing the cost of eco-friendly stuff, but the bulk will probably happen because the cost of being eco-unfriendly will go up. The original article is here – “Green fashion has new cachet“.